People often ask me what I do while I'm flying around as a pilot for California State Parks. Sometimes I like to tell them that I am a shepherd and then watch their reactions. It usually gets their attention enough to allow me a few brief moments of explanation and interpretation. According to Webster's New Collegiate Dictionary, a shepherd is a person who tends or guards sheep, and tends means to watch over. So in fact, I am a shepherd in the most modern sense of the word. 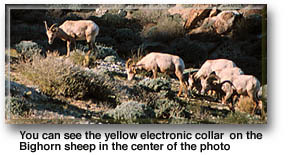 My staff is the electronic gadgetry the plane is equipped with, and the flock are the peninsular bighorn sheep that are trapped within the natural confines of Anza-Borrego Desert State Park and other protected wilderness areas in Southern California. Using radio telemetry from the air, I am able to receive signals from sheep that have been fitted with electronic collars, and monitor their whereabouts. Equally important, I can also detect when one of them has died. In our efforts to save the dwindling population of bighorn sheep, we need first to discover why they are dying in such large numbers. The California Department of Fish and Game and the Bighorn Institute in Palm Desert are working with California State Parks. Together, we've used fixed wing aircraft for surveillance and helicopters to capture and fit selected sheep with radio collars. The aircraft are an important tool for this process of scientific analysis because of the rugged terrain and vast wilderness in which the bighorn roam and live. From the air, after I receive a distant signal, I can easily fly to the most remote areas of the park. I'll locate a position by circling directly over the signal, and pinpoint on a map the exact location of the animal within about 50 yards. These signals are often undetectable from the ground because of obstacles in the terrain. Without the plane, important information about the plight of these sheep might be lost forever. After obtaining a fixed position on the signal from the air, researchers are then able to backpack into the location, if need be. They can recover the dead animal, haul it out, and then attempt to discover why it died. Over the past few years, a lot of sheep have died in Anza-Borrego Desert State Park, and it appears now that most of them have been killed by mountain lions. In the future, it may be necessary to put radio collars on the cougars as well! As it is, we continue to collect as much information as possible to provide for the future of the bighorn sheep and to maintain a natural place for them to survive and flourish. 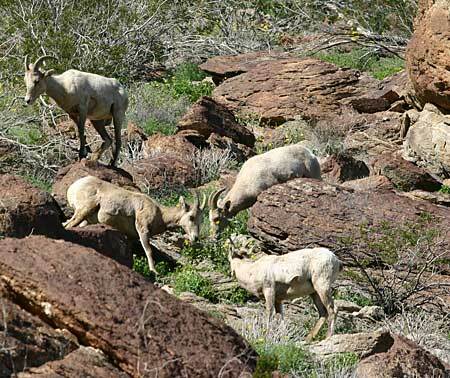 The "Bighorn Sheep Squadron" and its "shepherds" will continue to maintain vigilance from the sky and remain an important means by which to protect these noble creatures in their natural environment.